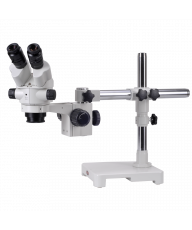 The Meiji EMZ-200TRB zoom stereo boom micro-surgical system is ideally suited for the demanding requirements of a microsurgery operating room. 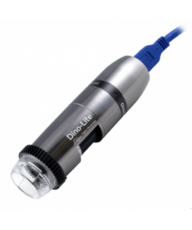 The compact optical unit delivers clear, focused images and the generous 200mm working distance gives the physician optimum maneuverability for performing delicate surgical techniques. The ergonomic S4200 boom stand and LED incident illumination offer a shadow-free secure observation platform. Limited Lifetime Warranty. 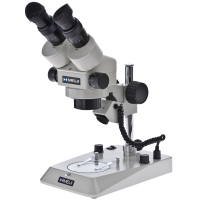 The EMZ-200 head is based on the EMZ-5TR, easily the most popular Meiji stereo microscope head. This workhorse model builds on that reputation while offering great quality and an affordable purchase point. 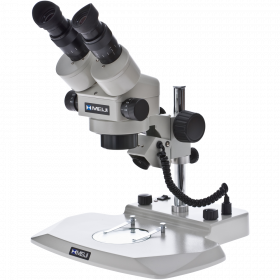 The parfocal zoom range is 3.9X - 25.3X with dual-sided zoom controls and a field of view range of 57mm - 8.8mm. 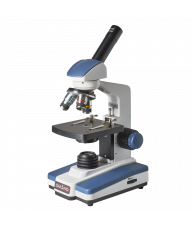 The working distance is 200mm for ease of maneuvering surgical instruments, a critical factor for any microsurgery procedure. 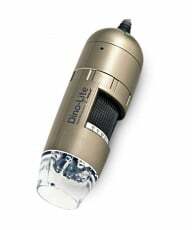 The head is inclined at a comfortable 30° and includes interpupillary adjustment of 54mm-75mm to fit a wide variety of users. 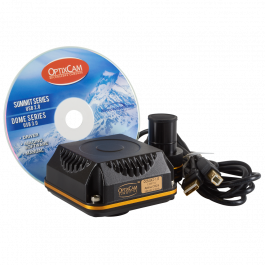 Dual eyepiece diopters ofer +8D / -7D of individual adjustment range resulting in much less eye fatigue. 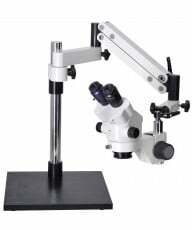 The head rotates through 360° allowing flexible observation positions for the physician. 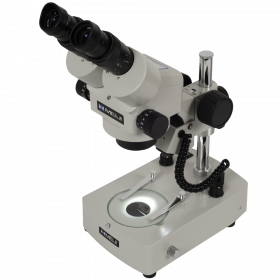 This trinocular version features an internal prism to re-direct the optical beam and a 0.6X C-mount Adapter. 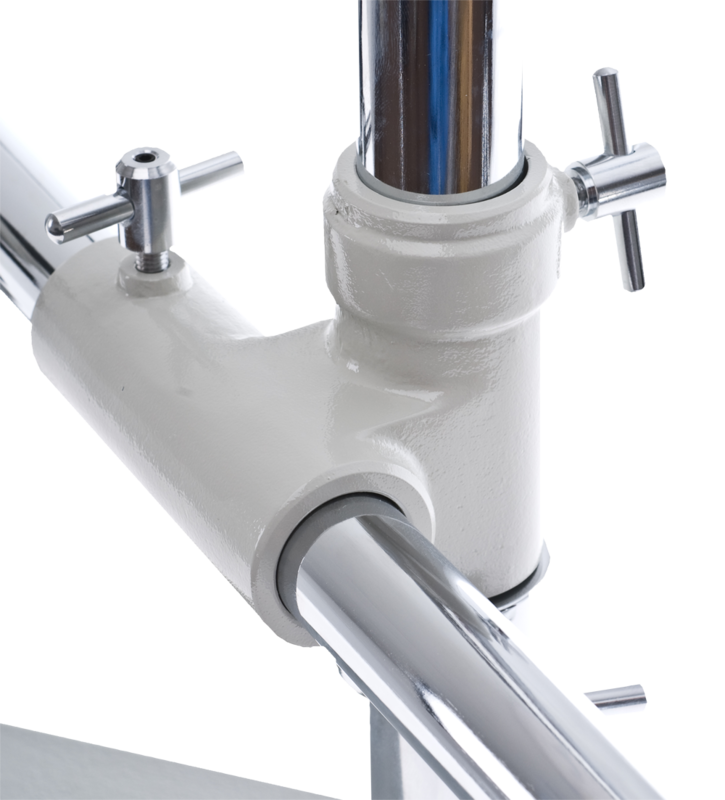 The Model S-4200 single-arm boom stand is one of our favorites. 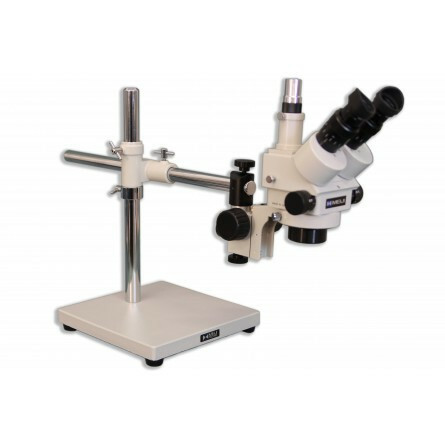 Well-designed with a compact 265mm x 265mm (10.4") footprint, it features 530mm (20.8") of horizontal reach and 610mm (24") of height, it is comfortable to use with beveled corners and a tall post which can accept specimens up to 500mm in size. 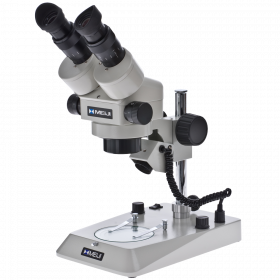 EMZ-200 TRINOCULAR - EMZ-18TRB zoom trinocular microscope body, MA520 SWF 12.5X Eyepieces, MA546 0.5X Barlow Lens W.D. 200mm, S-4200 Boom Stand, FR-LED Ring Illuminator, F focusing block, EMZ-8TR/PT#1 trinocular tube, MA151/8TR C-mount adapter.